Over the past few years, the trend of installing glass pool fence is increasing day by day. Due to the various benefits this fence provides, it is the most popular choice among home owners and commercial pool owners as well. It brings out the creative flavor and class to someone’s outdoors and also serves a very practical purpose. If your pool is larger than a standard size then it comes with its own set of requirements and considerations. Many materials used may not be suitable for such large pools because these pools require larger tensile strengths. Also, the glass may not be manufactured in such strips and boards and hence it would be quite inconvenient to find a fence to the size of the pool. For such pools, you will have to buy several smaller pieces and join them together for a bigger part which would eventually increase your cost. Many people think that they can do the job alone but it is not a project where you should experiment. Instead, you should consider hiring a contractor. A contractor may cost you more but at least the services would be professional and lack the hassles and surety of a job professional done will outweigh the slightly higher cost. You would be able to relax knowing that your pool fence is being installed by professionals. The materials that are going to be used for the fence greatly depend upon the main purpose of the fence. Whether your purpose is to increase the aesthetic appeal of the area or to keep children and pets from approaching the pool determines what materials should be used. If the fence’s purpose is children and pet safety, then the glass pool fence shouldn’t have sharp edges. You also need to consider if you want the fence to be fully transparent or opaque or a compromise in between. This wouldn’t by any means influence the price of the materials but this is an important thing that needs to be considered. If there are any government regulations regarding the fencing heights etc., then you need to take them into considerations too. Some government regulations restrict the fence height, distance from the pool and electrical wiring etc. You also need to keep in mind that outdoor pools have different requirements than indoor pools. The materials used for outdoor pools are more weather resistant and sturdy. Also, the materials are different because the glass’s reflected and reaction to sunlight needs to be considered. 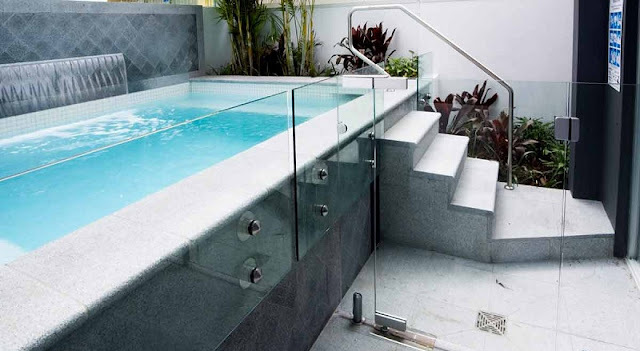 Overall, there are many factors that need to be considered while installing a glass pool fence. Instead of opting for a DIY project, you should consider hiring a contractor to perform the job professionally.